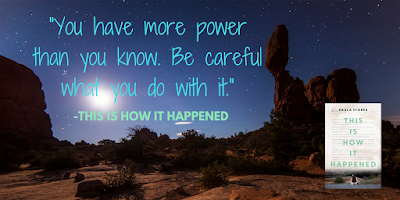 Here's the story about writing books quickly--it's hard, but it's doable. You probably know that after a book is announced there's usually one and a half years or more before it's published. But what you might not know is of that one and a half years, the author might spend only about three months writing the book. Another few months are shared between author and editor in revision and editing. And then usually a hardcover title for a major publisher is completely finished, aside from in-house proofreading, ten to twelve months before the publication date. Obviously this varies from house to house, book to book, and writer to writer. Paperbacks often have a shorter lead time. Some writers spend five years writing each book, but in that case the book is finished before it's announced or that release date is getting pushed back quite a bit. A delayed release generally results in delayed payments, and sometimes a delay in being able to sell more books. If you've read any of the "writer finances" blog posts I've tweeted lately, you know the only way to survive on a writing income is to sell, sell, sell. So basically what happened with this book is that I hit a wall with the previous book, Jack of Hearts. I sold that book on proposal, meaning in this case that my publisher bought the title based off an outline (sometimes a proposal involves a lot more than that.) I was already behind schedule with it and the sequel to Vicarious, because my anxiety had derailed the revision process for both of my 2016 releases and I spent way too long on final edits for them. But then I got halfway done with Jack of Hearts and I was just...stuck. I hated the main character, I didn't like the plot, and I felt like I had so many loose ends floating around it was going to end up as a 150,000 word contemporary novel. I tried to fix it--I really did. I went on a retreat, I signed up for an online writing class. I even went back to Copenhagen for inspiration! But nothing helped, and in late October of 2015, just two months before my manuscript was due, I asked if I could start over with a new book. My publisher said yes, what did I have in mind? I polished up a couple of my favorite ideas (contemporary romances, as that's what Jack of Hearts was so I figured that'd be best) as well as a couple other ideas--a Liars, Inc. companion novel with a speculative element, and the plot for This is How it Happened, back then called Shattered Hearts. I expected them to pick one of the contemp romances or the Liars companion, but they picked Shattered Hearts. Guys, I had literally come up with this idea a few days before. And now I had to outline it, write it, and revise it in about four months, and two of those months were November and December. My publisher offered me the chance to bump the book back a year, but that would have likely meant bumping half the payment back a year, which at the time was simply not a financial option for me. So I outlined the whole story ASAP so my editor could preview the plot and point out any major issues with it. Once I got approval on the outline in early December, I had about two and a half months to write and revise the book and turn it in by the beginning of March to meet the publication deadline. Oh, and I also had the sequel to Vicarious due to my other editor at the end of January, and a week trip to Seoul in mid-January. I haven't read the whole book since I got printed copies because I know if I do I will see things I want to change. I will think "If only I'd had more time. If only I could have done a couple more revisions." The reality of professional writing is that there is not always more time, especially not when you're trying to do it as a career, not when paying your bills depends on meeting deadlines. Alternatively, sometimes your book publication date is bumped back months to years due to in-house scheduling issues, even though your part is completely finished. In that case, you might feel like there was too much time. For the most part, writers do not call the shots on their books' publishing schedules. So...how did I write the book so fast? First, I had a tight outline. If you're writing on a time crunch, a detailed outline will save you because you won't have to stop to untangle plot problems or fill in plot holes. I also felt really strongly about the subject matter. I didn't have to stop and think "oh, but how would this character respond to that?" because I had been interested in internet shaming and its effects since 2005 and watched shaming dramas play out so frequently online. So it helps to be emotionally invested in your plot. Beyond that, I basically worked all day, every day until I was finished, giving myself mini-breaks to check Twitter or go for walks around the block. No TV (okay, I did watch iZombie), no movies, no hobbies, no social life. Thanks to tips from my friend Christina, I pretended like I was a resident doctor. Do you know what a resident doctor does for fun? They sleep. I got into a routine for eating--cereal in morning, sandwich for lunch, frozen thing for dinner--all easy to fix things requiring minimal thought. All my thought and effort went to the book. It's not a fun way to write, guys. But if you ever get into a situation where you feel like you have to get X pages done in Y days, whether it's a novel or a research paper for college or whatever, you can do it. More tips. If you've got friends and family nearby, ask for help. If your family is pretty needy, ask for patience. (I am not advocating anyone neglect their children, or perhaps overfeed their extremely needy cats on a regular basis, even though I might have done one of those things.) Find a mantra. Something you can repeat in your head when you start to get distracted or despondent. Mine was: "What matters most is how well you walk through the fire." That's the title of a Bukowski book of poetry. I haven't read it, but I saw that line on Instagram and it spoke to me. I just kept thinking that writing isn't supposed to be easy, and that if I could survive the next few weeks I could survive anything Publishing threw at me. Also, tiny rewards. Even if all you can do is set an alarm for five minutes and spend that time with your cat, or take ten minutes to walk to the store for a cupcake. Cut yourself some slack on your diet and exercise plan because it's only for a limited time and you need to minimize other stresses as much as possible. But drink water and get sleep and eat something vaguely healthy now and then--even if it's just buying a bottle of Green Machine and chugging out of it. Have you ever had to write something quickly? What are your tips for surviving the process and ending up with a solid finished product? Share your experiences in the comments! 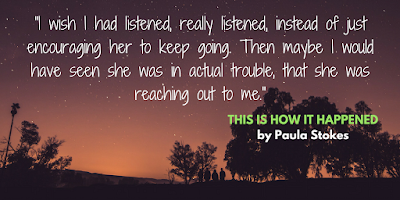 Want to win a copy of THIS IS HOW IT HAPPENED or any of my novels? Enter the Rafflecopter below. And look for tomorrow’s blog tour stop about the challenge of incorporating real setting into novels at Gabriella M Reads. 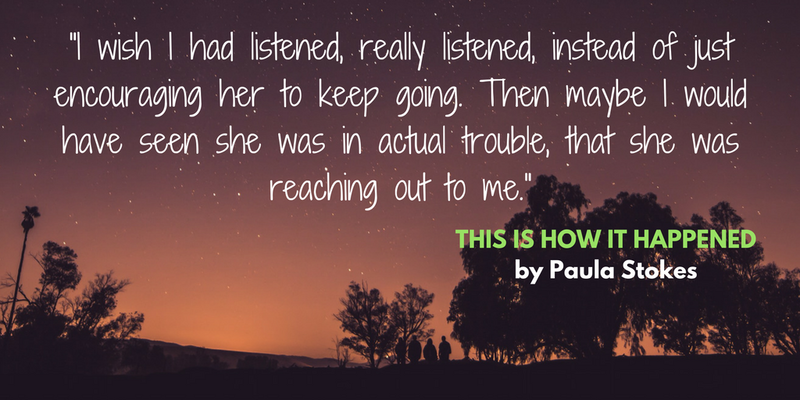 THIS IS HOW IT HAPPENED is available July 11th in the USA and on July 18th overseas. 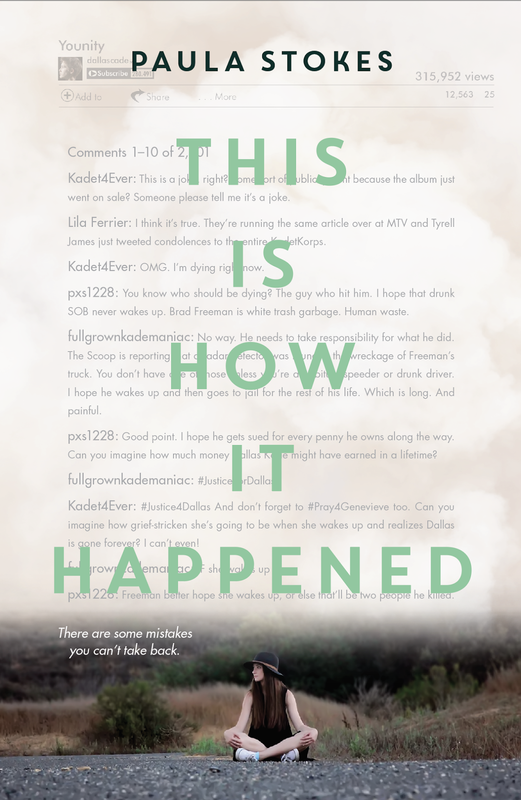 Read the first four chapters now or check out the discussion guide! My writing pieces are much shorter than yours, but typically I have to meet deadlines that are tight so I make sure all due dates are in plain sight with tasks listed. then as I accomplish each, it gets checked off. I also always have a tight, well-detailed outline before I start writing so I know where I'm headed and don't get off course (no time for detours). I wonder if you're familiar with Robert Lionel Fanthorpe? In the early Sixties, he landed a contract to write a paperback science fiction novel...every week. He was a college student at the time, so he dictated his novels on the weekends and gave the tapes to his mother, who ran a secretarial school, for her students to transcribe. Towards the end of the weekend as his deadline was approaching he'd occcasionally start talking faster so his mom's students would fight over who would get stuck with the last tapes. Sometimes he'd be short on his page count so he'd stick in whatever college paper he was writing at the time, which is why as his characters are hurtling towards a certain doom they might suddenly stop for a forty-page discussion of the history of water purification. Some of his novels are a little odd. So, yes, it is possible to write in a hurry...but hey, if you have six whole weeks, enjoy them! I would hate to have to write a book quickly, to a deadline! It must take a lot of skill!